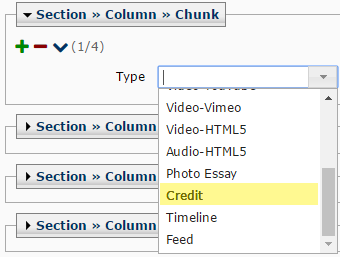 Use the Credit chunk in a longform to add credits/bylines to your longform. Navigate to Section >> Column >> Chunk. In the Type dropdown menu, select Credit. In the Content field, enter the credits. Each credit should be on a new line, as shown in the example below. The text will automatically be centered and italicized, there is no need to do that yourself. Here is an example of the Credit Chunk.